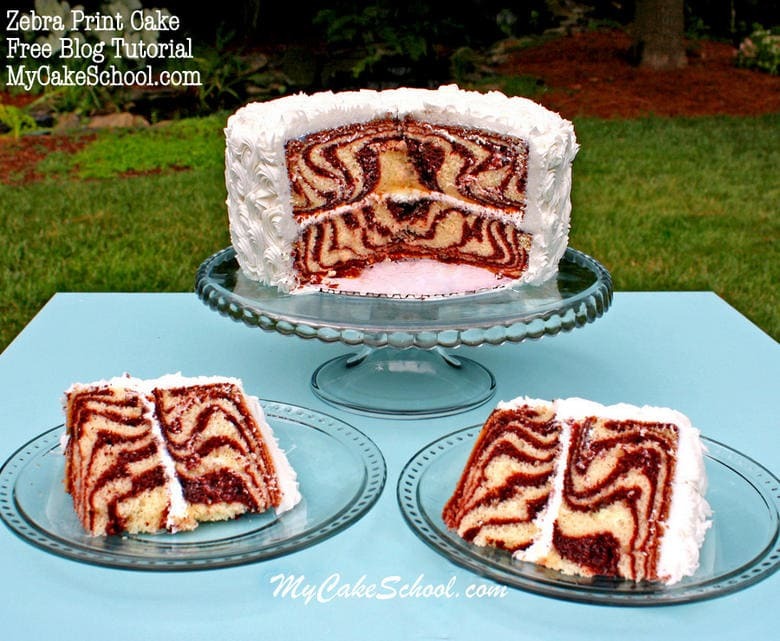 How to Make a Cake with Zebra Stripes on the Inside! Today I’m going to demonstrate how to make a cake with zebra stripes on the inside! This is such a fantastic surprise-inside cake and a fun alternative to a traditional chocolate and vanilla marbled cake. By the way, I did not invent the zebra cake. 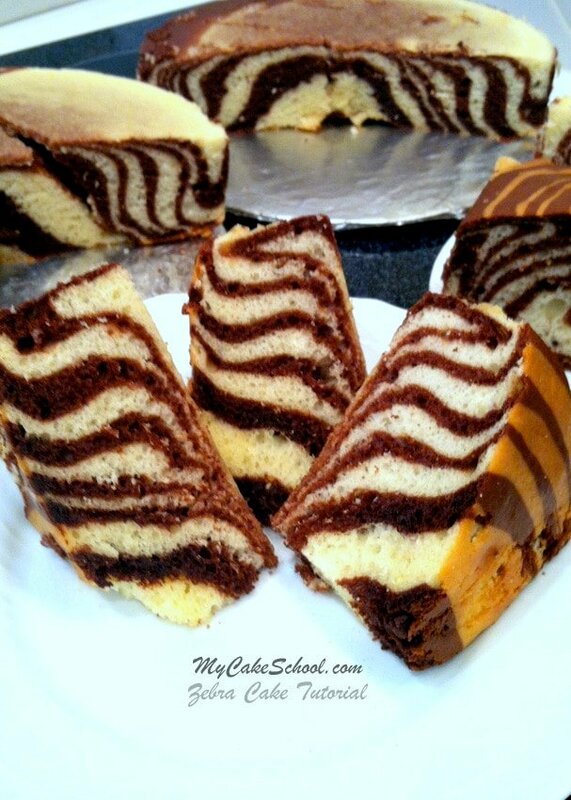 I’m not sure who did–but if you google zebra cakes, you’ll see all kinds of recipes that point to basically the same outcome–very cool looking zebra slices! You’ll see that part in just a second. First, let’s talk batter– You’ll most often see chocolate and white zebra cakes, but for a fun twist, you can tint your batter with coloring gels to create all sorts of unique combinations of colorful stripes! We went the boxed cake route and bought a box of Duncan Hines Devil’s Food Cake, and a box of Duncan Hines French Vanilla. We chose these because they don’t have pudding in the mix (like Pillsbury & Betty Crocker, which can be a little thick for this project–although I love them for anything else). 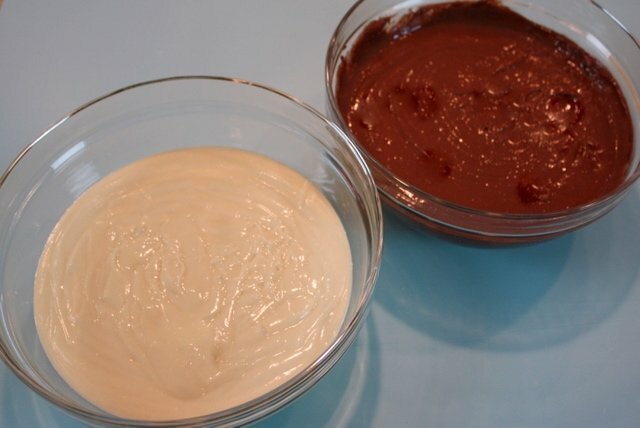 We prepared the batter for each cake mix separately and found the batter to be just the right consistency. 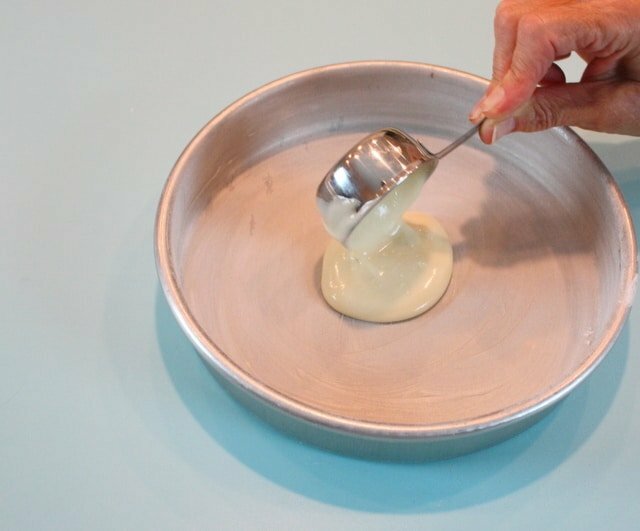 If the batter is too thick, the effect will be more difficult to achieve. If they batter is very thin, it may spread too quickly. (*** If you would like to try this cake with a scratch recipe, you can choose your favorite white or yellow cake recipe and then divide it approx. in half– you can stir approximately 3 tablespoons or so of dutch processed cocoa powder into one of your bowls of batter to create chocolate batter. 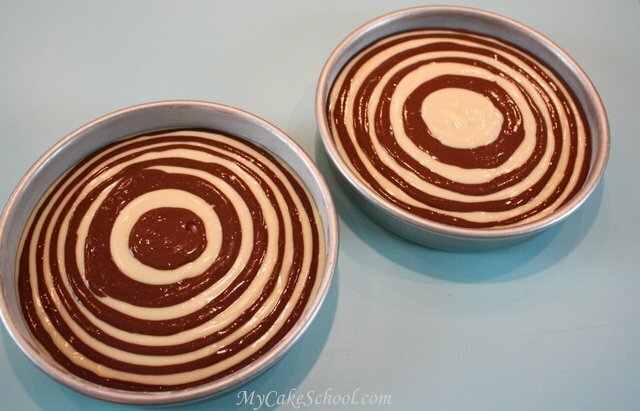 Now, let’s make a zebra cake! We started with our two bowls of cake batter…. 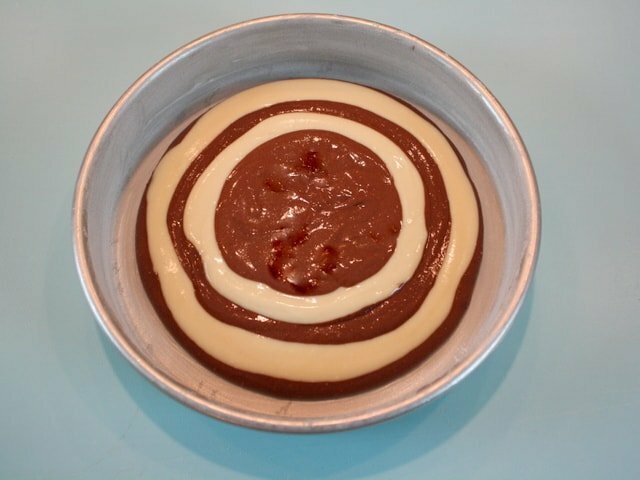 Measure out a 1/4 cup of chocolate batter and pour it in the center of your vanilla batter. Repeat this process, continuing with 1/4 cup scoops of alternating flavors, each flavor of batter dropped into the center of the previous circle of batter. 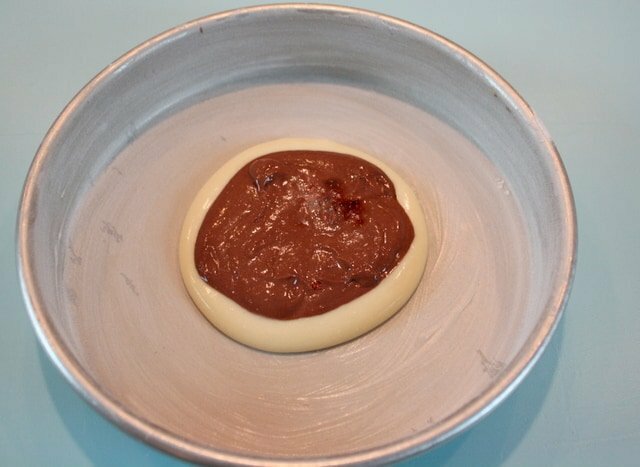 The batter is thin enough that it does not take long at all for the batter to spread and push out a little bit. 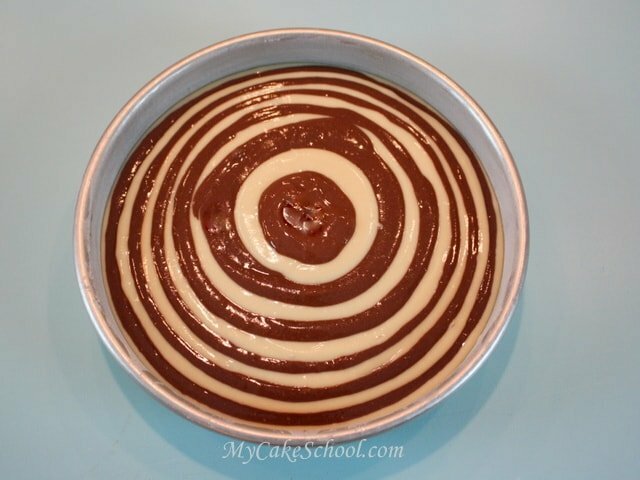 This beautiful striped batter is ready for the oven! I assembled my fat two layer cake as I always do…the bottom layer right side up, and the top layer top side down (with buttercream in between). I’m sure that the zebra effect would look pretty no matter how you stack your layers. After crumb coating my cake with vanilla buttercream, I used a Wilton star tip 21 (one of my faves) to do a reverse shell pattern with my medium consistency buttercream. I always love a nice reverse shell border, but I now like them even better when piped vertically! You can see that I staggered mine a bit so that neighboring lines fit nicely together. Is it just me or does my cake look like it’s wearing a snuggly buttercream sweater?! Whew! It worked! I couldn’t be happier with the outcome. 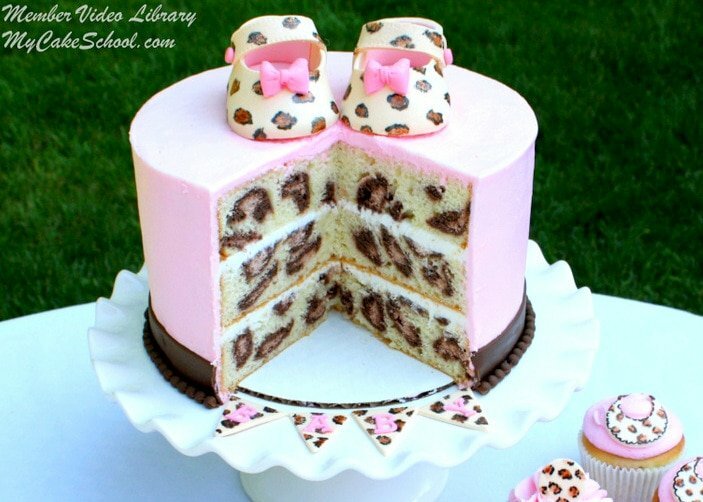 I LOVE these zebra print cake layers! It’s always nice to have a hidden surprise within the cake— if you haven’t tried this method already, make sure to put it on your cake “bucket list”. It’s so much fun, trendy, and looks much more complicated than it actually is, which I love! *An update~ When this tutorial was first created, the sizes of standard box mixes were larger (around 18.5 oz). Now, they are 16.5 oz. We tested the zebra cake again with the new smaller size and still had great results. Thanks for stopping by, and I hope that you enjoyed the tutorial! 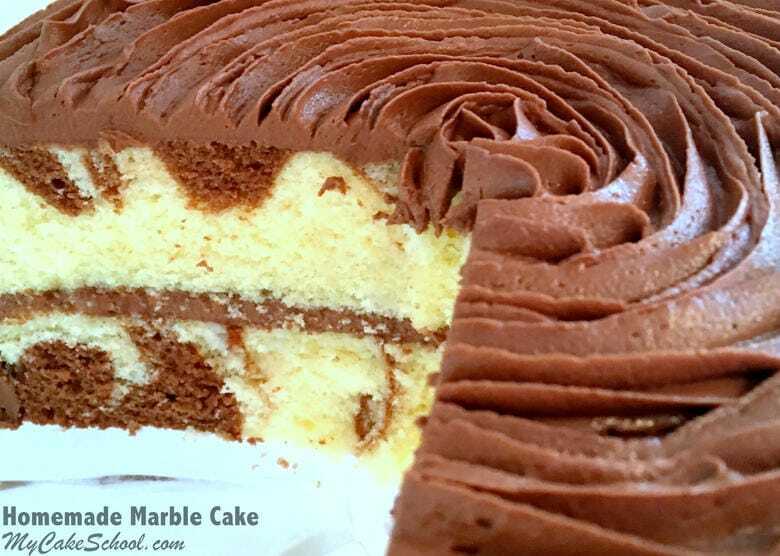 Or if you are just looking for a good old fashioned Marble Cake recipe, we have just the one! It’s good to have options! *For our full collection of cake recipes, frosting recipes, and filling recipes, make sure to stop by our Recipes Section! These recipes are tried and true! Then, pop by our Free Tutorials section for even more fun step by step cake decorating tutorials! Finally, if you are interested in learning even more about cake decorating, you should consider becoming a member of My Cake School! 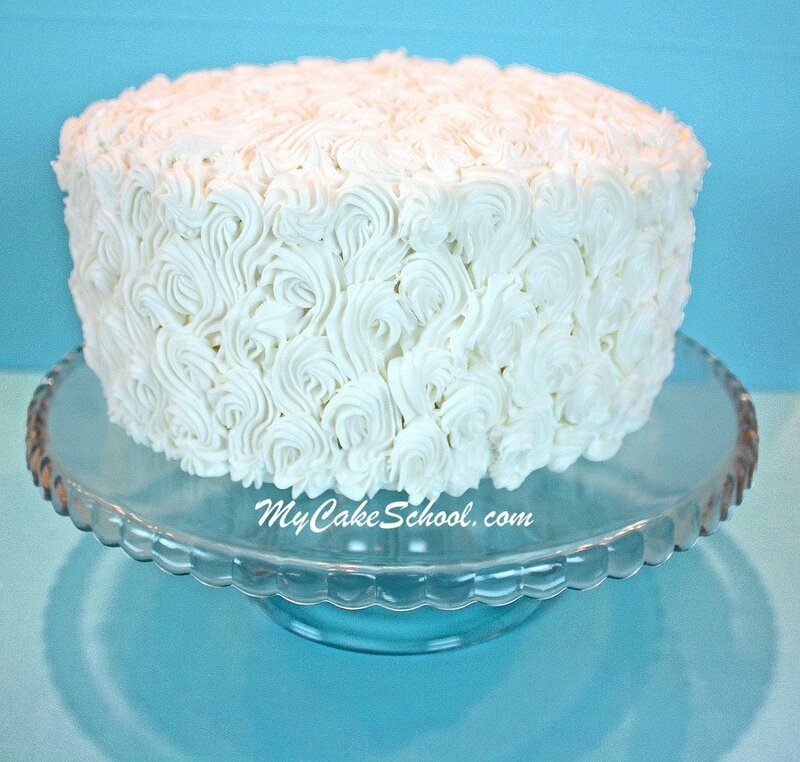 As a member, you will have online access to hundreds of our cake decorating video tutorials! Leopard Print Cupcakes~Free Blog Tutorial! Hi Sara- If you are using a raspberry filling/anything perishable, you’ll want to refrigerate. I refrigerate anything with fruit fillings. No problem to refrigerate for a couple of days, it will be fine! Hi Melissa, I would like to do this cake from scratch and my FAVORITE chocolate cake recipe is your Classic Chocolate Scratch recipe. I don’t have a favorite vanilla but was thinking of trying the Classic White Cake in your recipes section too. Would these recipes work or would they be too thick? Another question – I would love to do this print inside the purse cake and make a brown and white zebra stripe flap on the outside of the purse. Would these hold up to that too? Ill either cover in white chocolate ganache or fondant. Thank you. Hi paintmycake, we have not tried using those recipes for the zebra stripe cake so I can’t say for sure, but I think they will work. We have had many people try this with scratch recipes and have success, I just don’t know what recipe they used. The two recipes will hold up to fondant….and the zebra stripe flap on the outside of the purse would not add too much weight. I am assuming that you are using the “purse cake” on the site. It only has a small amount of carving so I think the recipes will be fine, and you will be chilling the cake before you carve. Wonderful, I’ve just been asked for an Africa cake from my nephew for his birthday, since we are going to South Africa a few days after. I have more or less got the outside decoration sorted, but this will just blow their minds when they cut it! Great tutorial and thanks! Yes, this is perfect for his birthday!! Thank you for the nice comments! … I tried it .. :) .. Thank you so much Bebe for your quick response. I was going to use a doctored cake mix and it has pudding and sour cream. My next question is just take out the pudding and keep the sour cream? Thanks. Hi Yashira, We have only made the zebra stripe cake using a cake mix without pudding in the mix, such as Duncan Hines. As in the instructions, the cake batter should be somewhat thin so it will spread out more easily. Unfortunately, I can’t say if adding sour cream would make it too thick. wah!!! I like this cake, I will make this cake on my son’s birthday, which is helding in next week. Can this be made with your marble scratch cake recipe just not swirling it? Hi Holly, It should work fine, just divide the batter as evenly as possible. Stir approximately 3 Tablespoons or so of Dutch Processed Cocoa into one of the bowls for the chocolate. What I cannot remember is how thick the batter of the Marble Cake is, hopefully it is not too thick so the batter will spread out more quickly………you can jiggle the pan a bit to coax the batter into spreading. It will be perfect for the baby shower! I really adopt your recipie for our customers. Is the cake baked on the middle oven rack? This recipe is great! So impressive! Will this work when making a baked Alaska? I think it would look really great with chocolate and lemon sorbet layers on top of the zebra layer,, mounds of meringue topping browned/torched and obviously taste delicious too!